You can experience up to 5 Gbps transfer speed, which is 10x faster data transfer and sync speeds than that of USB 2.0. The USB C cable also support USB 2.0 devices. Power charging can reach up to 3A. Data transfer and charging can be performed simultaneously. The USB Type C Specification version 1.1, 56kilohm, standard identification, which ensures a safe charging at 3.0A Maximum and the speed of data sync up to 5 Gbps. With the long and short cord, you can enjoy the data sync & charge anywhere and anytime in any occasions. The USB 3.0 USB C cable with braided nylon coating has good heat dissipation, fold-resistance. It is designed to withstand stress, twists, and pulls. The Aluminum alloy shell, the anodized connector ensures superior functionality under heavy usage. The sturdy construction with a flexible jacket and USB C connectors with molded strain relief provide reliable performance and long life for the cable. 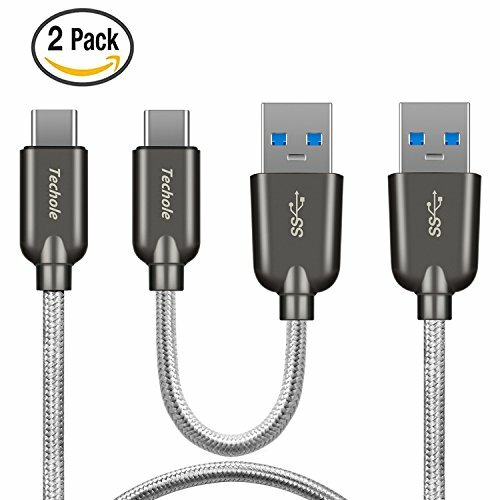 Compatible with all USB C Devices, Apple New Macbook, ChromeBook Google Pixel, Samsung Galaxy S8, Pixel C, Nexus 5X , OnePlus 2, HTC 10, Sony Xperia XZ, Lumia 950, LG G5, Asus Zen AiO, Lenovo Zuk Z1, HP Pavilion X2, ASUS ZenPad S 8.0, New Nokia N1 tablet, Nintendo Switch and other Type C devices. Featured 5V 3A cables will provide fast charging if cables are combined with a 5V 3A charger, cables will be forced to provide 2A current if the charger support up to 2A. We back our product with 24 months warranty Please contact us if you meet any question, we will handle your issue within 24 hours.